PistenBully select range impresses the market. Kässbohrer Geländefahrzeug AG presented its new stars in September 2011: PistenBully select – the young PistenBully 600s available only in limited numbers. The almost new vehicles are overhauled in line with the strictest Kässbohrer quality criteria and are supplied in a fully restored condition, including certificate, with extensive equipment and an attractive service package. This extended offer was very well received by the market from the start. 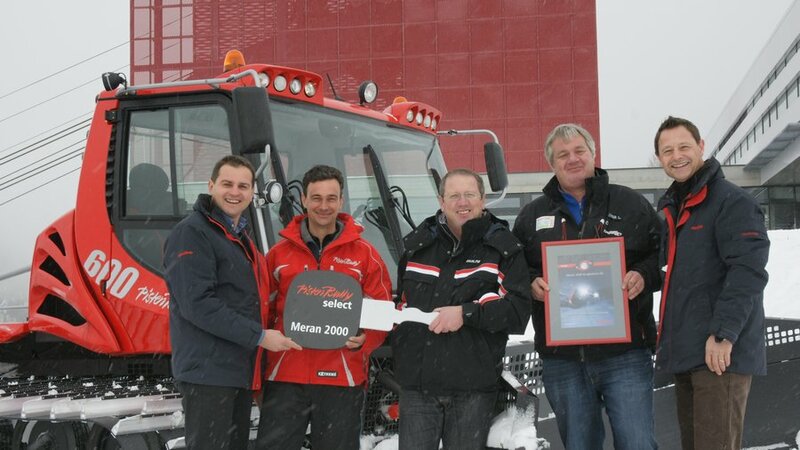 Meran 2000 is one of the first ski resorts to prepare its slopes for the 2011/2012 season with a PistenBully 600 select. Ski resorts that expand their fleet with a PistenBully select do not have to contend with any loss in quality compared to a new vehicle. The PistenBully 600s have been tried and tested on the slopes and are then restored by experienced Kässbohrer service engineers according to the highest quality criteria. Amongst other measures the engine is "factory-serviced" at Daimler, which means it is completely disassembled and all the parts are tested. Any defective parts are replaced. The engine is then reassembled from scratch so it becomes "like new". This is confirmed by a Daimler quality certificate. Each PistenBully select is also certified by DEKRA. These arguments also convinced the Meran 2000 ski resort to add a PistenBully to its snow grooming fleet for the first time. The PistenBully 600 select recently began preparing the slopes. "It's great that we've been able to win new customers alongside our long-term ones with our PistenBully select offer. This confirms our strategy in the used vehicles sector", says Harald Häge, Area Sales Manager at Kässbohrer Geländefahrzeug AG, Laupheim. In addition to quality, profitability and price, the equipment and service also make a PistenBully select stand out. Each of the vehicles is equipped as standard with xenon lights and fixed running wheels for greater endurance. New combined tracks, an Alpine or ParkFlexTiller and a completely overhauled blade are also part of the equipment package. Just like a new vehicle every PistenBully select comes with a full manufacturer's warranty. For the first time, Kässbohrer is also including the 100-hours customer service and the first two summer inspections in a service agreement. A voucher for one training session is also included. PistenBully select are available as a standard vehicle, as a ParkBully and of course as a winch vehicle. "We are convinced that the PistenBully 600 select is a perfect complement to our range and the demand on the market for the limited number of available PistenBully select confirms this", continues Häge. Highly coveted from the start and now available as PistenBully select: our PistenBully 600. Expand you grooming fleet now with these top-class vehicles. Every PistenBully 600 is equipped with xenon lights, fixed running wheels for greater endurance and an Alpine or a ParkFlexTiller. Almost new and only available in limited numbers. PistenBully select offers you vehicles, which can definitely hold their own against our new vehicles without further work. Every PistenBully select meets the highest Kässbohrer quality standards. In technology and service alike. Top technology at an extremely attractive price. Voucher for one training session included. Full guarantee as for a new vehicle. Only at Kässbohrer: 100 hours' customer service and two summer inspections. Every PistenBully select is DEKRA-certifi ed. Restored to the highest PistenBully quality criteria. The engine is completely rebuilt and certified by Daimler.